Food just tastes better outdoors. But when preceded by a Bloody Mary bar, a backyard meal, served straight from the grill on colorful hand-painted plates under a breezy canopy, becomes a feast for all the senses. For a group of catering experts gathered for an early summer cookout, stimulating the visual and culinary palates is second nature. Despite the country-chic decorations and extravagant floral arrangements, this isn’t a wedding or reunion; instead, it’s a rather quotidian event for life-long friends Tara Letts and Ragan Lewis, co-owners of Colorful Palate catering company. 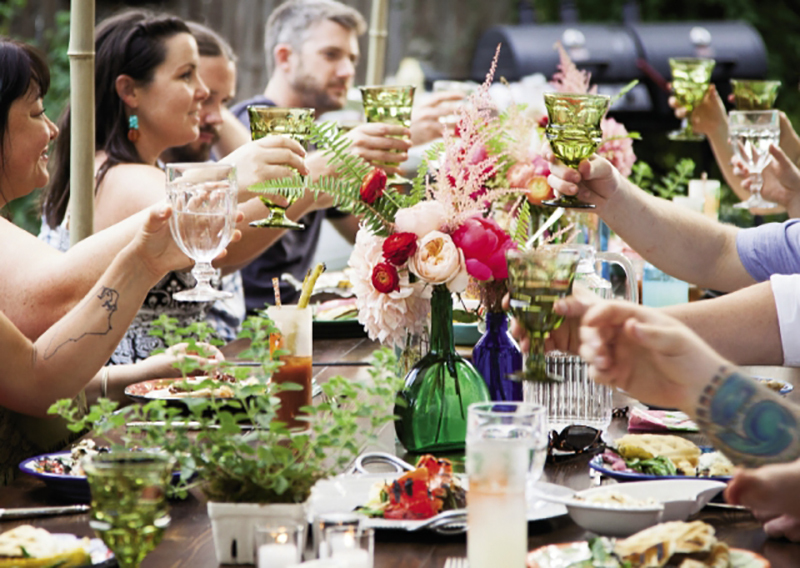 They created a brunch-inspired cookout in a West Asheville garden for their friends, colleagues, and families—an opportunity to enjoy each other’s company before the wedding season ramps up. But just because they’re relaxing doesn’t mean they’ll ease up on the creativity. Even casual events benefit from the partners’ forethought, and the ladies spent days considering the theme of the gathering. Since Lewis and Letts were experimenting on coworkers and friends, they decided they had leeway to try something new and different. “We like to make breakfast all day,” says Letts, “and we just thought, well, everyone loves breakfast. Why not try to make everything on the grill?” Lewis nods: “It became a challenge, like, ‘What can we grill now?’” she explains. The menu ran the gamut from Bloody Marys and peach Bellinis to a blackberry panzanella salad and spicy lamb burgers on biscuit waffle buns. This was to be a backyard, made-from-scratch, cookout extravaganza, and practically every item would get a twirl on the screaming hot grill. On the big day, Ben Malone, a chef for Colorful Palate, mans the grill. First he sears fruit for the cocktails, grilling tomatoes and peaches to bring out the natural sugars and deepen their flavors with a slight smokiness. Once the peaches cool, they’re puréed and mixed with brown sugar to create thick nectar for the sparkling wine Bellinis, which accompany silver dollar pancake canapés topped with bacon and maple cream. Upon arrival, guests dive into the canapés and cocktails along with grilled peach juice and old-timey bottled sodas for the children. The drinks sit atop a retro backyard bar with floral-printed pitchers and matching glasses from the ’60s. Spicy Bloody Marys packed with pickled okra, grilled celery sticks, and olives pair perfectly with the second round of hors d’oeuvres: crisped sweet potato skins for dipping in El Diablo Pimento Cheese, a house-made spread from the Colorful Palate’s True South food line. Innovation guides the friends, so rather than discarding the peach peels from the grilled fruits, they flash fry them. The tasty little chips that result make a crunchy garnish for the grilled corn bread panzanella salad with its layers of blackberries, cilantro-mint pesto, and local feta cheese. It’s one of the many dishes served family-style on a long farm table beneath a willowy canopy. Colorful family heirloom plates, emerald green glasses, and sage-colored cotton napkins from Lewis’ grandmother elicit excited murmurs from the children. “It’s so pretty,” one whispers as they see the setting for the first time. The main attractions include buttermilk-battered, skillet-fried green tomato rings drizzled with strawberry-jalapeño sauce and playful breakfast burgers. Letts and Lewis create the patties from lamb and spices. But the bun inspired them the most. “We played around with the idea and thought, ‘sausage and biscuits,’ but liked the concept of a waffle,” explains Lewis. “I threw some biscuit dough in a waffle iron, and we have baffles!” The textured, buttery pastry serves as a clever bun for the burgers. Toppings include a satisfying salty, dense grilled halloumi cheese, mustard grilled red onions, and maple aioli. The guests pass platters of pickled beets, peppers, and French green beans, all of which add spectacular color to the table and zest to the already full-flavor meal. Letts and Lewis work together as cohosts with the familiarity that comes from a long friendship; they met at age seven. Their families cultivated their love of food and entertainment: Letts made and sold pound cakes to make pocket money, and Lewis grew up in a healthy-lifestyle family that celebrated vegetables. Letts went on to attend Johnson & Wales University to study the food industry. Since starting Colorful Palate in 2002, the old friends have met plenty of new comrades who share their interests. For this event, frequent collaborator Melissa Thomas, owner of Flora boutique in West Asheville, contributes vases brimming with bouquets of garden roses, ranunculus, astilbe, sword ferns, privets, and peonies. For dessert (yes, even breakfast calls for dessert on some occasions), Mandy and Chris Butler of 50/Fifty baking company create an artful trio on simple white tableware, the most refined and work-intensive dish of the day. “We wanted to do a dessert trio with summer fruits but also showcase chocolate,” says Mandy, who has logged 15 years as a pastry chef. The Butlers reveal small, perfect portions of peach pound cake sticks with maple buttercream, delicate Nutella tarts with candied hazelnuts, and shot glasses of yogurt and fruit parfait. These miniature portions provide an elegant flourish that ends the meal. Breakfast-all-day concludes at dusk as the grill cools and friends help clear the dessert plates from the table. Letts and Lewis smile with satisfaction because the Colorful Palate team has found a new theme to share with future clients and friends in the making. • Do as much as possible in advance. • Pick a menu that allows you to prep ahead of time, so you can enjoy your own event. • Ask your friends who are good at certain things to do them. Most people like to contribute. Know a fire starter? Set them on the fire pit. A grill master? That’s his or her job then. • Ask someone to bring ice (so you don’t have to think about it). • Ask someone to bring a particular course if they love cooking and want to contribute. • When setting your table, consider including an heirloom piece asdecoration. • Is it a birthday? Have vases available to plop flowers in if someone shows up with a bouquet. • If your specialty isn’t dessert, pick up or arrange for something beautiful and special to end the meal.